My best friend of 32 years came from Nashville to visit me in Arizona. 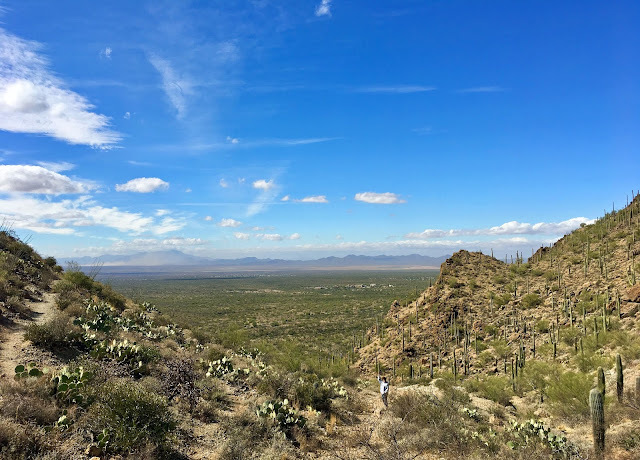 Here she is (the very tiny person in the center of the photo) at Gates Pass, standing in the caldera between the Tucson Mountains - seen in the distance - and the Santa Catalina Mountains, which are not visible in this photo because they're behind me. The road through Gates Pass began in 1883 when it was carved out by Thomas Gates, a local pioneer, saloon keeper, and rancher, as a shortcut to his carbonate mine in Avra Valley. A sign at the top of Gates Pass says, "While exploring these mountains, he found this natural canyon, marked by 'bubbling springs, streams, and lush growth'. Gates paid $1,000 to clear and grade the winding road over this pass, which now bears his name. Three years after he built this road, he was appointed the superintendent of Yuma Territorial Prison. Gates made it one of the best-run prisons in the country." 2005: Sorry, no post on this day. The blog didn’t start until May 2005!